In the early eighties Asia was called a supergroup. 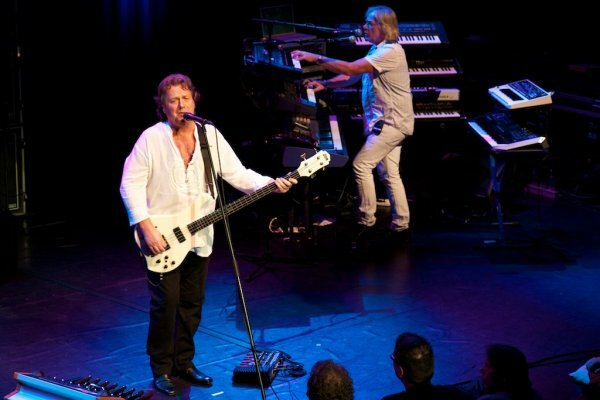 Consisting off one of the best guitarists in the world, Steve Howe from Yes, one off the best drummers in the world, Carl Palmer from E.L.P, John Wetton from King Crimson and U.K. and Geoffrey Downes from Yes. The origins of the band members attracted a lot of attention from the prog loving crowd towards this group, but their music was a bit too A.O.R. influenced and poppy for the ears of many of them. The composition of the band was not very steady over the years, they even ceased to exist for some time and the quality of the albums was not very consistent, but still in their glory days Asia filled stadiums. In 2006 the original line-up came back together and since then released 2 new albums. 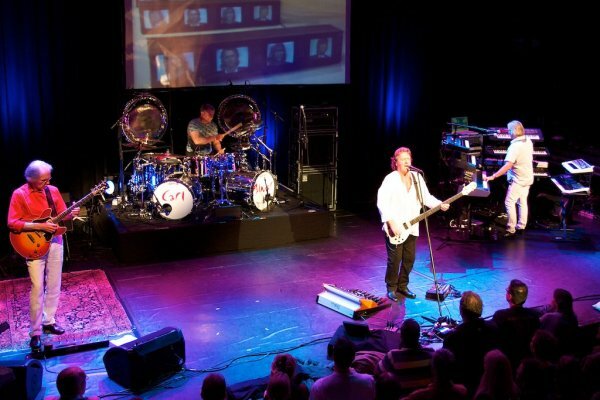 After their latest outing Omega, they decided go back on the road for an extensive tour through America and Europe which also brought them to the Netherlands, to The Hague to be exact in the hall �Het Paard van Troje� (wrongly called � Het Parrd� on the Asia website). Hearing that they would play there surprised me a bit, this hall is certainly not known for their programming of prog related bands, but the hall could hold 1100 spectators, so I thought it would attract a lot of A.O.R. and classic rock lovers. Apparently I wasn�t the only one to be surprised to find this classic eighties band in this hall since only about 200 people had shown up. Looking around the crowd I hardly saw any of the familiar faces I see at most prog concerts, so it was clear this concert didn�t attract many prog lovers. With an average age of 40+ it was clear only classic rock lovers bothered to come, so with two closed balconies and a half filled room the concert started quite punctually at 20:30. It was immediately clear the sound engineer had set up his equipment based upon the assumption the place would sell out, or he smoked to much (Dutch) weed and thought the hall was a stadium. In any case the volume was cranked up way too high with the vocals of John and guitar of Steve suffering in particular saturating the mix at an almost painful volume, as a result of that the drums and keyboards were a bit inaudible, a shame though as Geoffrey brought 8 along! After three or four songs it became a bit more bearable, but I can�t judge if that was because the volume was turned down a bit or better balanced or that my ears had adjusted themselves. The band didn�t show any sign of some kind of disappointment about the low attendance and it must be said that they presented the audience with a really good and professional show, although a bit short with just a 1 song encore (naturally Heat of the Moment). Apparently DPRP was the only one who had obtained permission to photograph during the concert which enables us to present you some exclusive pictures here, but that permission was only given for the first two songs; initially we were told three, but on the evening that was reduced to 2 with the argument they would be "long" songs. Hearing that I thought for a moment Asia had gone prog when on stage, but the songs turned out not to be much longer than 5 � 6 minutes, so it was shooting and running from spot to spot like hell for our photographer Dave until he was kindly asked to put away his camera directly after the second song. In general the security in this hall was tight like in an old East-European country, although they didn�t do a body search; maybe this hall is often visited by FC Den Haag hooligans or some other aggressive audience, but this crowd really didn�t need any close observation. Surely the band is used to these strict arrangements from playing in the bigger halls, but here it all seemed a bit misplaced. The setlist consisted of some songs from Phoenix and Omega and several classics from the original first 3 albums. 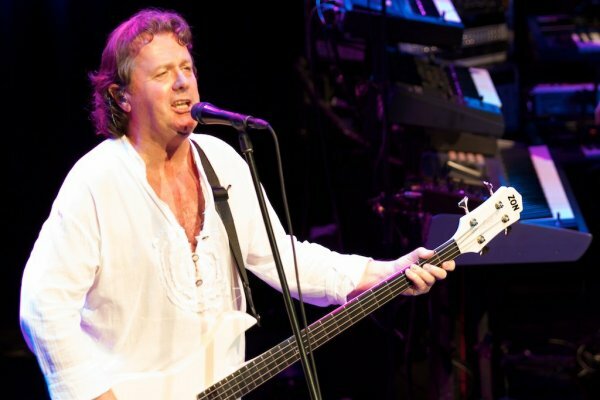 I will never become a fan of the voice of John Wetton and although he gave all he got and the sound volume worked against him it was clear he couldn�t reach all the notes which only confirmed my description of �not quite� when I refer to his vocal qualities. 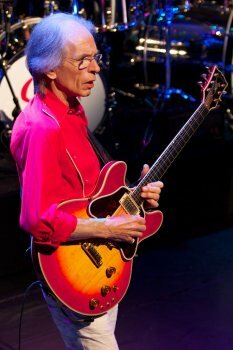 Steve�s guitar playing was excellent as ever and just as expected as his stoically attitude and expression. I'm still amazed when he skips over from one guitar to another, mounted on a stand, several times within a song without one glitch. His acoustic segment came early in the set and gave Steve another chance to show his guitar playing abilities that ended with the almost obligatory Clap. After that Steve told the audience, after his microphone was finally put on, that he hadn�t played that tune for weeks, even months. 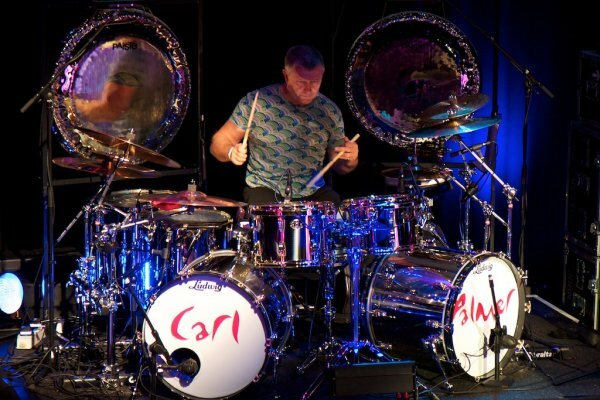 Carl gave quite a show with his frantic drum solo later on; juggling his drum sticks in the middle and bouncing them off the drum skins was impressive too, a real showman. Too bad Geoffrey didn�t also get a moment of his own with his battery of keyboards. All in all it was a really good and enjoyable show, above expectations and I must say I fully enjoyed myself, partly because of hearing those songs again that I so much enjoyed when I first discovered Asia in the eighties and partly because these grey haired old men still know how to rock and put down a good show. This concert certainly deserved a better sound engineer and a bigger audience! As Joris indicated the photography was a hectic affair and I decided to use the closed balcony as it gave me a wide range of shooting angles, all unobstructed by the audience, the downside being that all the shots were from above. I was half expecting to be thrown off being as I climbed a lock gate to get up there, but thankfully I was left to shoot in peace. I was hoping they'd let me continue, but a security guard came up at the end of "Only Time Will Tell" and asked me to stop. I'm flabbergasted as to why this rule is enforced, surely the more time the better the pictures, the better the pictures the better the publicity for the band� Anyway, at least it meant I could spend the rest of the gig watching the music (and some of the pretty ladies in the audience) and as Joris said, the very restricted photo rules meant we had quite some exclusivity - I was even approached by another publication who asked if I they could use my photos click here. Despite this Asia delivered a pretty good show and were in places amazingly good. OK these are world-class musicians and the material is hardly stretching their skills, but given that they're approaching pensionable age - Steve, John and Carl are all ovary 60 - it's no mean feat to play with such energy. Carl for one does not look his age at all and doesn't act it either judging by his flamboyant solo, full of high energy, technique, stick juggling and all sorts of antics - really entertaining. Steve brought Clap out of the locker for his solo and despite having seen him play this live about 15 times over the years it has been a while and I thoroughly enjoyed it. John and Geoff consigned themselves to some piano/vocal renditions of Don't Cry and The Smile Has Left Your Eyes with the band joining the end of the latter for a very powerful crescendo which led into what was for the the best section of the show and one of the most enjoyable twenty minutes of live music I've seen for some time. Of course this was a run of songs from the first two albums (Asia and Alpha, albums that horrified me back in 1982-1983, but that have grown on me over the years and the debut in particular has stood the test of time very well. Alpha was always handicapped with awful production and patchy songs, but the best of these when played live are superb: powerful, melodic, catchy and bringing back of lot of fond memories from when I was a young man. I was delighted to hear Wildest Dreams, one of my favorites from the first album, shame they didn't play Cutting it Fine, but I'm not complaining. The newer material holds-up less well than the early songs, whether that's because they're not as good or because of the older stuff is part of my teen years it's difficult to say, but they just don't evoke the same response in my opinion. Perhaps one exception is the excellent Extraordinary Life which Wetton wrote as a response to his health and alcoholism issues. 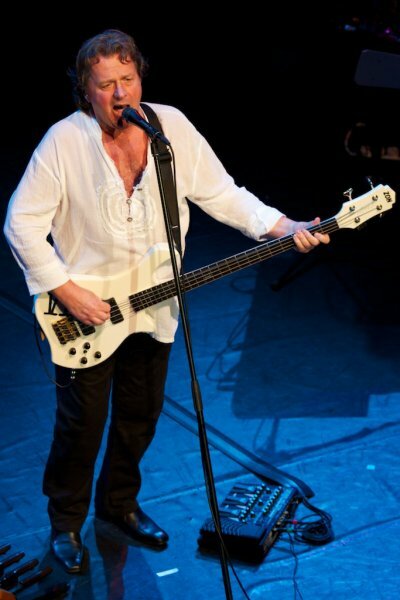 Kudos to John for winning both his fight with the booze and recovering from heart-surgery to be still there on stage delivering the goods at the age of 61. John's voice isn't perhaps the force it was, but unlike Joris I'm a huge fan of it right from the Crimson years to the present day, and he's still a tremendous (and very underrated) bass player. 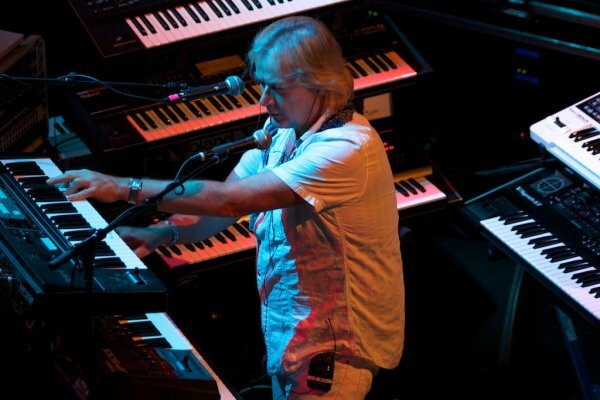 Another pleasure of the show was Geoff Downes. Yes he didn't get a real solo spot, but it's nice to see a real keyboard player jumping between banks of nice sounding synths as opposed to using one big controller keyboard loaded with patches. Many of Geoff's synths were clearly originals from the 80's and 90's and with these he faithfully reproduced the correct sounds from the early works - I wish more keyboard players would take such care with their sound palette. I was a little surprised no to see any Mini-Moog in his equipment, but was pleased to see an old Akai S5000 sampler lurking in the background. After Carl's tremendous drum solo the band closed-out with the very popular Sole Survivor, another of the great tracks from the first album. Of course there was one glaring omission from the set that was obviously kept for the encore, Heat of the Moment. 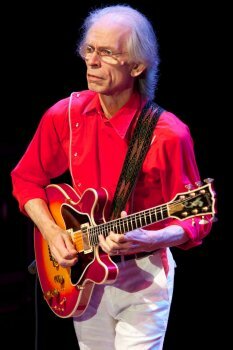 One gripe I have of Steve Howe came out a this point, he refuses to put too much gain/distortion in his sound, but really this song cries out for it in the opening chords and sound a bit lifeless without it. Anyway, once the band jump in it's OK and the crowd loved it, there may not have been many present, but they made plenty of noise during the song-along section at the end. A very enjoyable gig, much better than I had expected and far superior than the live CD Spitit of the Night released last year.